Here is a sight that I do not often see...the end of a warp...this is the end of my nine yard warp in serger thread I put on over a year ago. Yup - twenty seven feet of black and navy blue polyester serger thread. 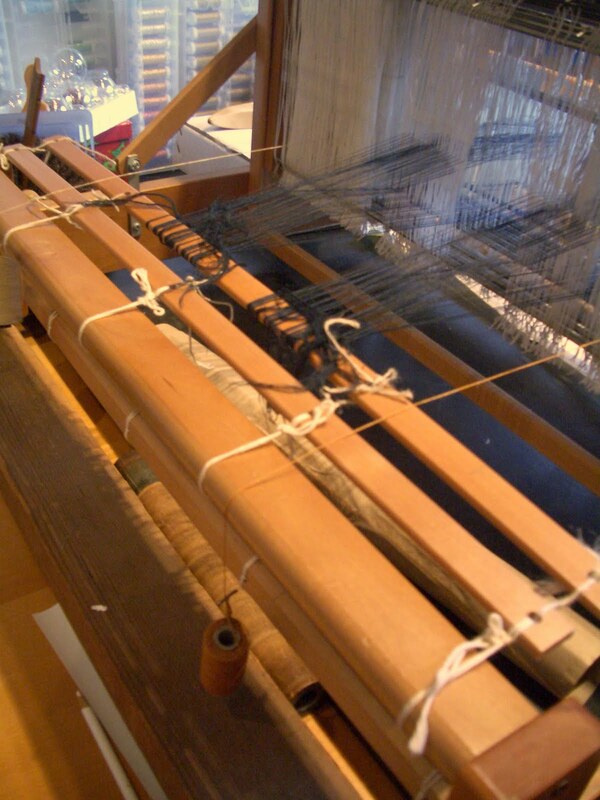 Apparently, the warp, all ends included measured out to more than a mile of thread. No wonder I rarely see the end of my warp. 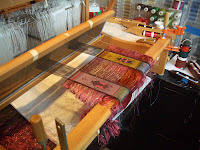 I should go and count but I am sure I have woven more than three dozen beetles and a couple dozen small pieces for note cards. Plus, two large family of beetle pieces. One of the family pieces got into the Eye Dazzlers exhibit and will be shown at the Albuquerque Convention Center in July. A collection of my individual sixteen beetles is currently on display in Fiber 2010 West at the SCIART gallery in Camarillo. I've included a photo of my last two beetles for awhile. These are from the family Cetoniinae - the flower beetles. I think I need a bit of a break from beetles...but still need to weave a few more to take my vision to fruition.